When I looked very closely at the tappet adjustment cover on the side of the rocker box, there were a couple of small cracks radiating from the fixing holes - obviously from over tightening and it was anything but flat. Now I know from inspecting (and measuring) every component, that this engine had done nothing prior to it's removal and storage, so if it did have such a low mileage, the tappets would have rarely been adjusted. 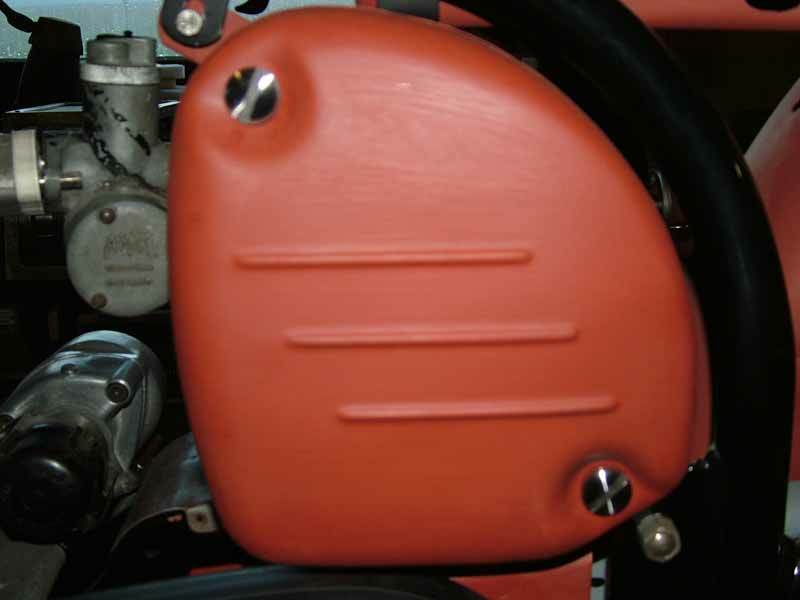 To me this means that this cover plate is vulnerable to ham-fisted owners - another potential weak spot, and if oil leaks from so high up on the engine, it will end up all over the place - so what to do? I could trawl eBay for another, which might be even worse, I could search for a new one - or I could just make one from dural sheet which will be stronger than a thin shell casting anyway. 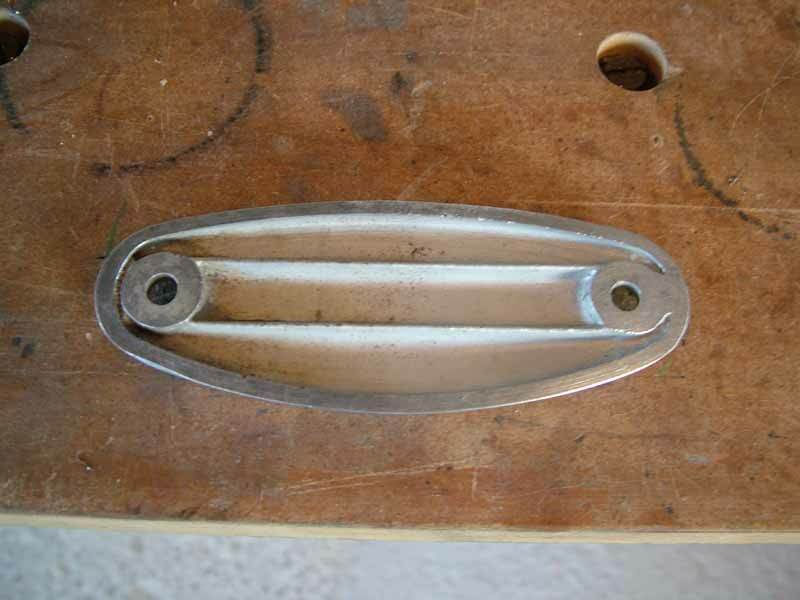 This is the outside view of the offending cover plate - I think the counter-bored holes are a bit deeper than is necessary, leaving insufficient thickness at the bottom, especially on a thin shell casting. I can remedy that too if I make another. This shot shows the inside of the cover, the small cracks radiate from the inner edges of the bosses towards the holes. As can be seen from the photos, it's not particularly complicated and the back doesn't even need to be relieved like the original, there's nothing inside to catch on anything, so it can stay flat but I would like to have the big letter 'N' in the middle, even though it's high up under the rim of the petrol tank - that could be made separate and stuck or screwed on, or the plate machined to leave it standing up in relief. Guess which I did?........................ Now where's that birch twig? This is the rocker box which the tappet cover fits on - all the surfaces check out flat and smooth. Unfortunately there is not enough material to mill a groove all the way round to fit an 'O' ring seal like Mr Honda (my hero Soichiro!) would have done - that would have been a permanent fix. Yet another piece of that lovely scrap Dural sheet (I hope I can find some more bits if I run out - it's really useful for jobs like this) It was clamped directly to the machine table, using that excellent Machine Mart clamping kit and the counter-bored holes done first. 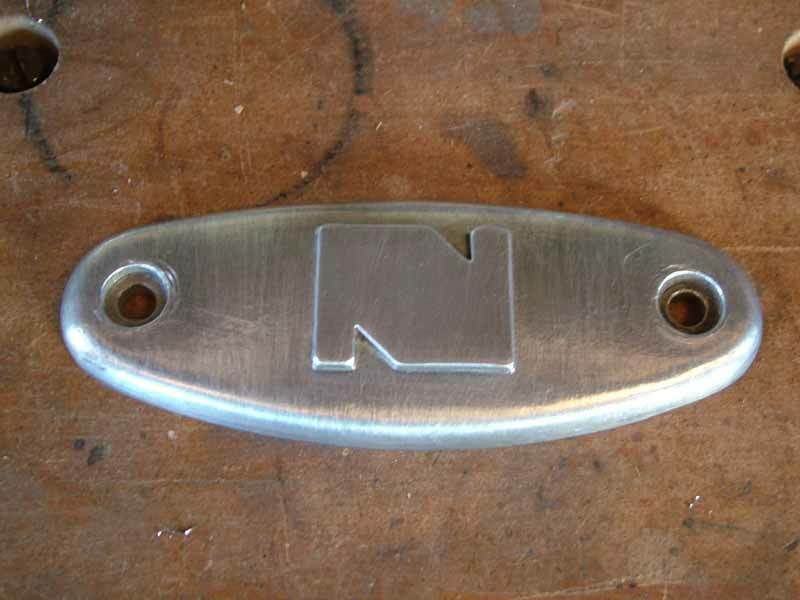 It was then just a matter of milling the surface to leave the letter 'N' standing proud. Once the detail work had been done, it was time to band-saw around the shape. The next stage will be to file the outer shape, followed by a bit of profiling to lose some of the observable bulk. I intend leaving it about 3mm thicker than the original to prevent it buckling like it did before - again it might not suit the purists! It fits onto the extended rocker spindles with sleeved nuts. 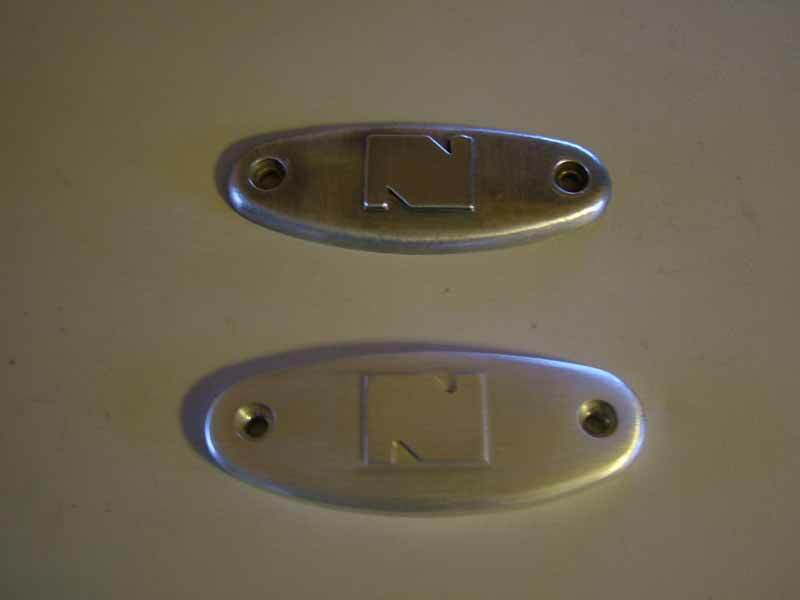 Those might need to be re-made a bit longer (in stainless - of course!) due to the extra thickness of the plate. The finished article at the bottom, I left the little radii on the 'N' - I could have gone in with a small chisel and finished off with a needle file - but why? The perspective of the shot makes the new one look bigger - it is thicker as described, but fits perfectly. 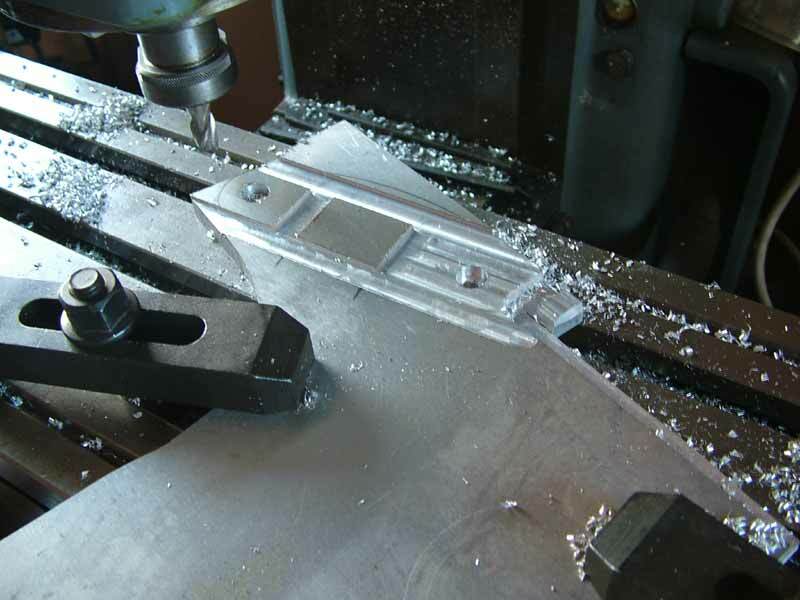 I considered machining an 'O' ring groove in the joint surface, but I'll leave it for now and see what happens. Without a CNC miller it's a bit tedious working two slides at once. One of the reasons, I believe which made Japanese bikes and cars more reliable than those offered by other manufacturers, was their great attention to detail - in particular, nothing was left 'flapping in the breeze' which could be clipped or bracketed to something solid. This is especially true with control cables and wiring. I am attempting to use this procedure for as many of the cables as possible without making it too obvious to anyone but the eagle-eyed. This was yet another one of those jobs which I just fancied tackling. In view of the fact that I had fitted taper roller bearings to the steering head, the top bearing stands a little higher than normal so the dust shield needs to be a little deeper to make it look right and cover the gap. It's a while since I attempted any spinning work, especially in stainless, so I elected to use the process for this component. True, it could be turned from the solid, which is a waste of a lot of material. 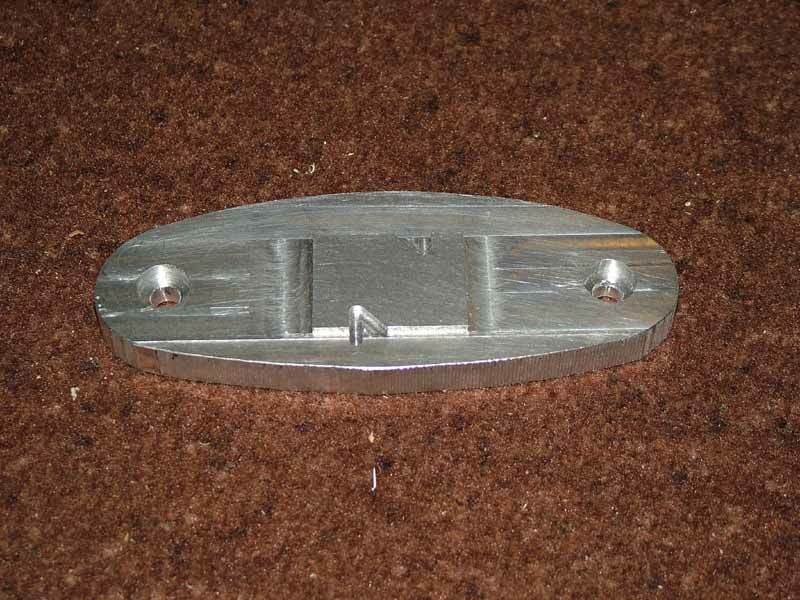 I made a former from a large lump of scrap mild steel with dimensions to suit the INSIDE of the finished part, then with a blank disc centred and mounted against this, all that was then needed was a trapping block held in place with a heavy duty revolving tailstock centre. In the past I have used a piece of hardwood mounted in the tool post as a 'pusher' to persuade the material to conform to the pre-made former. I'm sure these are available in stainless somewhere, but I was in the mood to make a pair. First job was to check the angle in the lid where the screw seats - this measured unsurprisingly at 120 degrees. 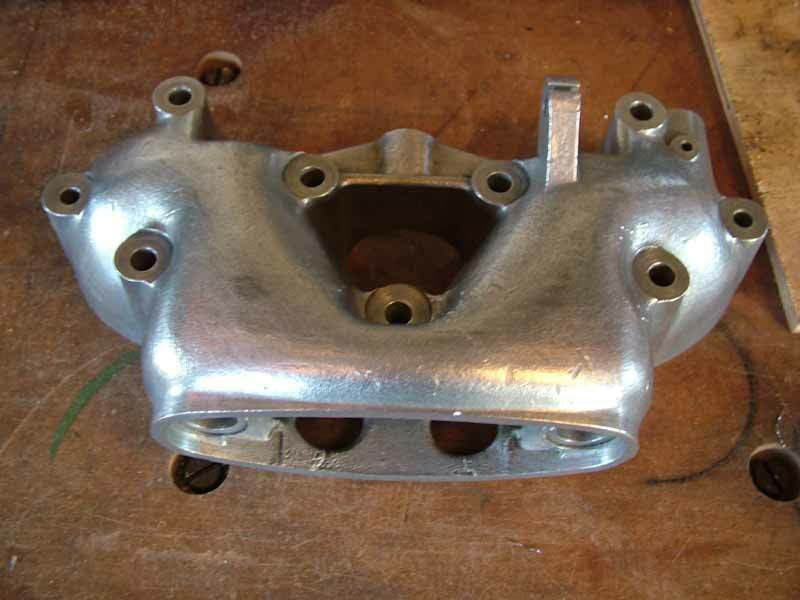 It was a simple turning and threading job, but when parting off, a lot of the head crown shape was done before final removal from the chucking piece. 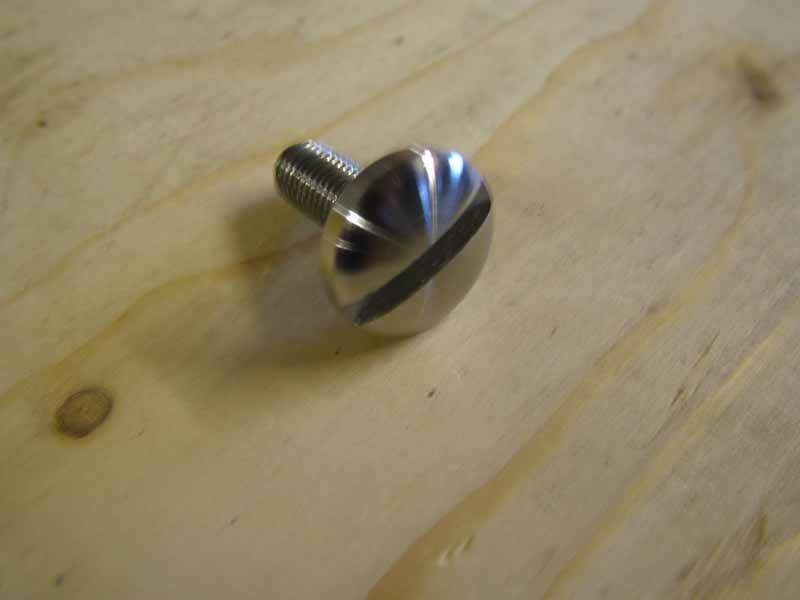 Once removed they were screwed into a piece of scrap mounted in the chuck for final finishing and polishing of the head. 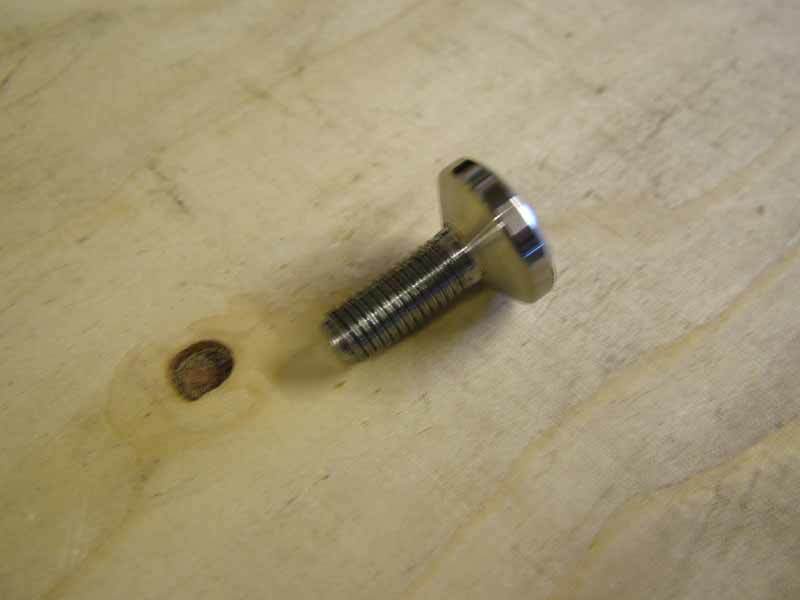 The piece of scrap, complete with the screw was then transferred to the miller for the slot to be cut, then the second was positioned the same way for it to be completed. There are probably a few more bits which might need an explanation to any interested parties, but really it's now just a matter of wiring and adding a few more fixing bolts before I can run it for the first time. I might put a brief section on the site about that, but the next major section will be the strip down and preparation for the final painting. It's still (at the moment!) going to be black and ivory like that excellent example in the first part. I just might get it MOT'd and registered in the primer stage - depends on how things go. The weather might have a hand in the process too, although as I write this in early January 2010, when virtually the whole country is grid-locked by a very thick blanket of snow, here in Orkney we have only had a thin dusting and our temperatures have only been hovering around freezing, compared with the minus 15 around Manchester.